I wish I didn’t have to work – but that has never been and will never be an option for us, financially, and we knew that going into marriage, into parenthood. I would like nothing more than to have been there to see every moment of my children’s lives as they were growing up, to be available to chaperone field trips and volunteer in the classroom. And I can certainly empathize with the guilt expressed in this post. But I am not sorry that I work. 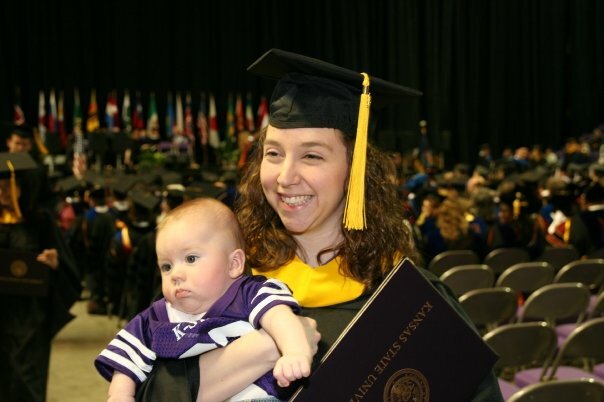 K-State graduation for my Master’s degree – holding Ethan. I am not sorry that I work. I am not sorry that I am showing you what an educated, successful woman looks like. I am not sorry that I am teaching you about sacrifice, delayed gratification, and responsibility by demonstrating my work ethic. I am not sorry that you are learning women are just as capable of bringing home the bacon as they are frying it up in a pan. I am not sorry that you are learning the value of pursuing higher education for a career. I am not sorry for inspiring you to reach for the stars. I am not sorry for continuing to show you that women can do anything men can do, and vice versa. I am not sorry that your father and I have shown you what it means to be partners, to be a team, to be equal. I am not sorry that you had the opportunity to play with other kids every day of the week. I am not sorry that you learned being away from us never meant forever. I am not sorry that you understood, very early, that you can always trust us to come back for you. I am not sorry that you learned how to feel safe and happy with other people through that trust. I am not sorry that you are learning how to play, imagine, explore on your own because I’m too busy sometimes. I am not sorry that you see how exhausting work can be. We raise you. We teach you. We love you. We are there for you. We teach you that things aren’t always easy. We show you that life doesn’t have to be amazing and magical every second of every day – but it can still be perfect as long as we love each other. I don’t feel guilty for working. I feel a little sad that you’ve grown up so much and it’s gone by so fast, and I wish I could have seen more of it. But I’m not sorry that I work. I work to provide for you, I work to be a role model, and I work to make you proud. And Daddy works for all the same reasons.